One in 9 people in Canada will acquire an infection as a result of a hospital stay . These infections can have an enormous negative impact on vulnerable patients with depressed immune systems and kill between 8,500 and 12,000 people each year . Appropriate hand hygiene (hand washing with alcohol gel) can prevent over half of these hospital acquired infections. However, it can be difficult for a busy healthcare worker to remember to wash their hands up to 100 times each shift. Many jurisdictions have instituted education campaigns followed by audits where auditors stand in a ward and observe hand hygiene compliance. There is a growing recognition that this type of auditing is not a reliable since there are examples of hospitals with very high compliance but also with relatively high rates of hospital acquired infections. A number of electronic hand hygiene/monitoring/prompting systems have started to come onto the market. Some are receiving backlash from many front line workers because they are viewed as humiliating and create a perception of being monitored. One alternative solution is to install video cameras that are monitored real time by low wage workers overseas. Existing system are typically very expensive to install and often do not provide prompting in a way that is viewed as helpful by healthcare workers rather than a system that is designed to broadcast their mistakes. We have developed and tested a patented electronic hand hygiene prompting system that assists caregivers by providing gentle reminders to wash their hands (shown above). 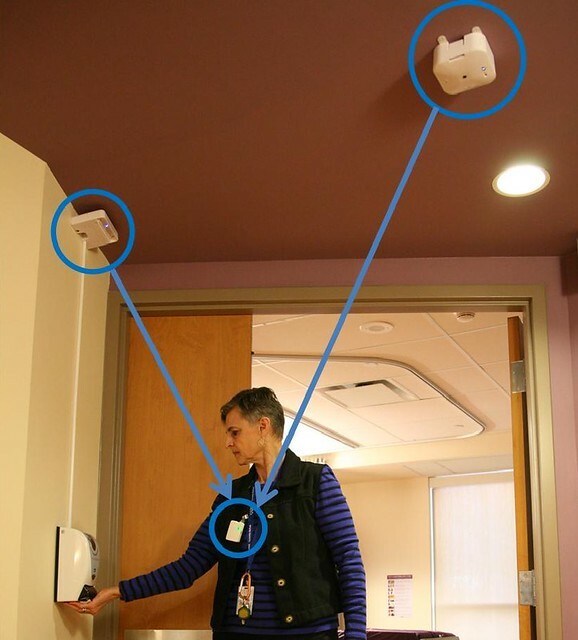 The PIP (Personal Infection Protection) system consists of a badge worn by healthcare workers that communicates with beacons mounted inside and outside each patient room as well as attached to alcohol gel and soap dispensers. The badges remind workers to wash their hands by vibrating discretely when they enter a patient room without performing hand hygiene. Once the worker activates a soap/alcohol gel dispenser, the badge stops vibrating and a green light turns on. A clinical trial in a 50-bed Complex continuing Care setting demonstrated that our hand hygiene system more than doubles hand hygiene activities and sustained performance. Perhaps more importantly, the system was viewed favorably by front line staff. We are now engaged in a large evaluation to verify its utility and acceptability in a variety of institutional environments.